If you're looking to buy cheap crystal items from China, but don't from where to start, this article would help you with some solid information. Of course, as there are thousands of crystal items from about 100 suppliers, I can’t list all of them here. Instead, I would just go for the main types of crystal items so you can evaluate the potential using your own expertise. And, because the prices are fluctuating from time to time because of material price, labor cost, currency exchange, and market demands etc. The prices here can only serve as reference, NOT actual prices. 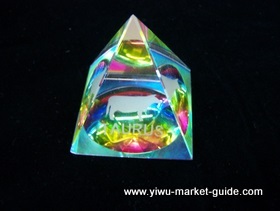 Yiwu does not produce any crystal, but it's pretty strong for crystals. This is because Pujiang, a city 30 minutes away from Yiwu, is well known in China for making crystal items. A lot of Pujiang crystal producers set up their selling offices in Yiwu market. There is an exclusive section called "crystal and ceramics" on Floor 3, District one of the main market. Most of crystal suppliers are in this section. You can also find a dozen crystal shops on the same floor. A few more shops in district 4 are also selling crystals. 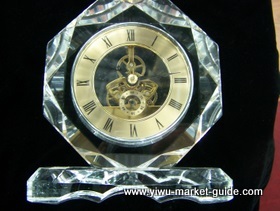 This 16cm high crystal clock is about 12.50 USD/per. 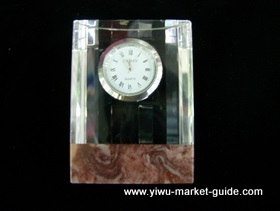 This 10cm high small clock is about 5.15USD/per. This clear crystal clock is about 12cm in diameter. Price is about 1.75 USD/per. 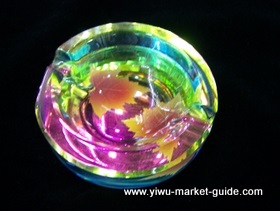 This is a color crystal ashtray. 8.0 cm diameter. Price is about 1.30 USD/per. A small clear crystal cone. 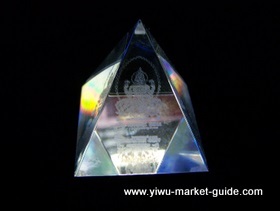 This clear crystal cone is about 40mm base, w/ a Buddha carved inside, about 0.73 USD/pc. This is multi-colored small crystal cone. About 40mm base. K5 crystal. W/ some letters and an animal figure carved inside, about 0.41USD/per. 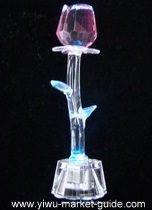 A crystal angel with led. 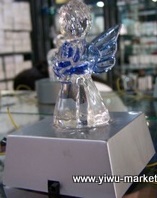 A crystal owl in Yiwu market. 11.0cm high. K5 crystal. About 2.20 USD. 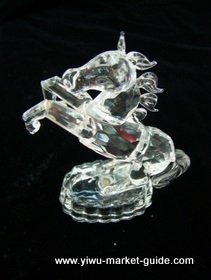 Small crystal horse. About 13.0cm high, 2.50 USD/pk. This is not crystal. It's acrylics! 10.0cm high. 6 colors assorted in a case. Only about 0.21 USD / per. A small crystal rose. 9.0cm tall. W/ cell battery and led bulb at the bottom to display 2 colors. About 0.22 USD/pc. Gift packing. Can be used as wedding favors. 11cm tall. W/ cell battery and led bulb at the bottom to display 2 colors. About 0.35 USD/pc. Many types of crystal fruits are also available in Yiwu market. 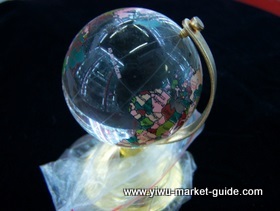 This crystal globe is about 5.0cm in diameter. 0.34 USD/pc. 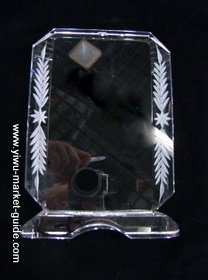 K9 A grade crystal medal, 20.0cm tall, about 5.90 USD/per. 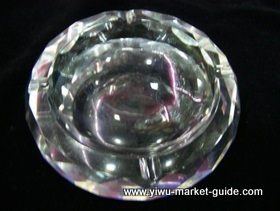 Small crystal candle holders, 16.0cm tall, K9 crystal, about 3.95 USD/per. 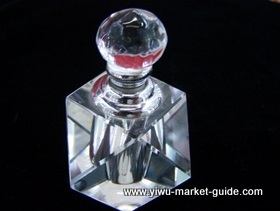 small crystal bottle, about 6.0cm tall, 0.40 USD/per. 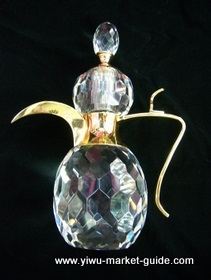 big crystal bottle, about 26.0cm tall, w/ gift packing, about 33.00USD/per. Crystal items here are from low end to high end. They supplying different markets from mid-east to Africa. MOQ, in most cases, is 2 or 3 ctns. Total purchase value about 300 USD. As most of the crystal items are heavy and fragile, they need VERY GOOD packing. If the packing is poor, you will find them arrive in pieces. 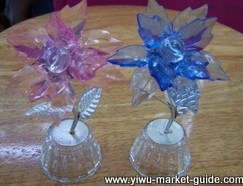 >> Return to buy from Yiwu from buy crystal items from yiwu china.